50 years ago today, Kudryavka, aka. 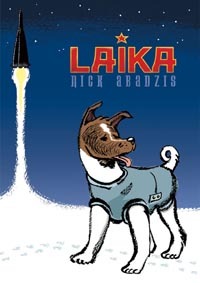 Laika (Russian for “Barker”), became the first living passenger from Earth to reach space. She died from stress and overheating just a few hours into what was to be a seven-day flight, but the plan was always to euthanize her remotely at the mission’s end as the Soviets lacked the time and resources to plot her safe return to Earth. This was because then Soviet leader Khrushchev wanted a second spacecraft launched in celebration of the 40th anniversary of the Bolshevik Revolution, November 7, one that would top the recent success of Sputnik. The American press nicknamed her “Muttnik,” and it was long after the political ramifications of the flight were exhausted that her inhumane treatment became the focus of the debate. 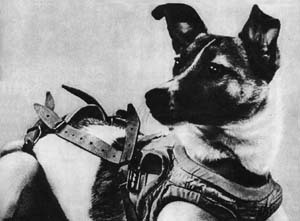 Kudryavka lived as a stray on the streets of Moscow before her life in the Soviet Space program, where she was renamed “Laika” because it was catchier. Much of the inhumane treatment she and other animals suffered, such as long periods of confinement and intense training, were invaluable to planning human space flight; however, nothing was gained scientifically by sacrificing Kudryavka in a mission meant solely for political gain. Sputnik 1 was a fantastic accomplishment; Sputnik 2 was a complete failure. None of this makes Kudryavka any less a hero in the canon of space explorers. First in space is first in space. “She is perhaps the only character in the Monument to the Conquerors of Space (1964), other than Lenin himself, who can be individually identified by name,” and numerous stories, music, and even a soil target on Mars carry on the name and legend of Laika. More photos of Kudryavka on this discussion thread. What is this “Geeking Out” thing, exactly? Yay, you finaly got your weekly friday article.